Hillary was a great candidate—brilliant, articulate, experienced. Her opponent, Donald Trump, was magnificently flawed—he seemed unelectable. But as it turned out, my efforts to lift Clinton into the White House, as the first female president in American history, weren’t enough. Her loss to Trump on November 8, 2016 shattered me. Like so many people, I brooded and became a keyboard activist on Facebook. I soon realized I was suffering from depression because of Trump and his administration. The anti-women rhetoric and behavior of Trump prompted the January 2017 Women’s March, an international protest on the day after Trump’s inauguration. I was there. So were millions of other women, men and children in hundreds of cities across the globe. I went with my family and a few friends to march at the Minnesota capitol in St. Paul with about 60,000 other protesters. The sound system blared out, “TELL ME WHAT DEMOCRACY LOOKS LIKE!” We chanted in response, “THIS is what democracy looks like!” and we reveled in the passion that each of us brought to the march. That day was my first real step into political activism. It felt good to get off the computer and onto the streets. I felt my depression lifting. I felt better surrounded by people who were on fire, and energized to change what had happened in this new and terrible time of Trump. Jan Parks (top row, far right) says her introduction to true activism began at the Women’s March in St. Paul, Minnesota, the day after Donald Trump took office in January 2017. 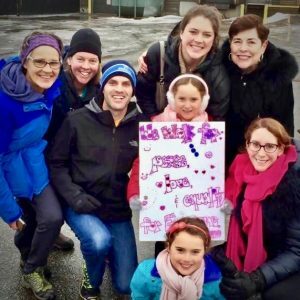 Her fellow marchers included (back row) her friends Barb Anderson and Karen Jansen, her daughter Kelly Anderson (middle row) her son-in-law David Anderson and friend Meredith Klein. Meredith’s daughters also attended. I didn’t know what to do next, but leaders I encountered in this new “resistance” movement said to contact my Congressman, Erik Paulsen. Paulsen, a Republican, had been serving Minnesota’s Third Congressional District since 2009. His district comprises an area west of Minneapolis made up of several primarily upper-middle class suburbs. Because of the affluence of this district, I soon learned that my district would be one of the most hotly contested and expensive races in the country. Paulsen’s strict adherence to Trump policy was unacceptable to me. Furthermore, the majority of Paulsen’s constituents had voted for Hillary Clinton—Trump lost to her by 9.4 percent in the Third District. Paulsen’s voting record wasn’t at all representative of the views of most of the people he was serving. He liked to convey the image of being an All-American guy, a family man, a Boundary Waters enthusiast, and a moderate Republican. But his record wasn’t moderate at all. I definitely had a bone to pick with Erik Paulsen, but I doubt he received or read any of my messages because I never heard back from him, or any of his staffers. So, I decided to go and find him myself. My first attempt was at a February 2017 Third District town hall meeting in the Minneapolis suburb of Plymouth. I gathered up my adult daughter and two friends and we went to see our congressman, along with about a thousand of his other constituents. But he didn’t show up. No joke. In fact, Paulsen hadn’t actually attended an official town hall since September 2011. Instead, he would utilize robo-calls (sent out to constituents willing to listen), and he didn’t reappear in the flesh for a town hall until 2018, when polls showed he was lagging behind his new Democratic Party opponent, Dean Phillips. More on him in a moment. Yet even with Paulsen missing at this meeting, his constituents lined up to offer their thoughts on public issues. One woman was a hospital emergency room doctor who spoke passionately about what she called an “emergency room crisis.” The crisis has come about because many people have no preventative care, she explained. They have no health insurance. If a child’s eardrum bursts or a woman goes into premature labor, the uninsured must resort to finding help and treatment at the closest hospital emergency room. As a result, the number of ER patients has become unmanageable. Hospitals can’t legally turn patients away, but patients wait for hours, and some just end up leaving without care because the lines are so long. And there were students and their parents, and the elderly and the disabled, all wanting to speak directly with Paulsen about their concerns, but to no avail. I was incensed that Paulsen had insulted his constituents with his absence, and I fired off my first anti-Paulsen letter-to-the editor of the weekly newspaper serving my suburb of Bloomington, The Sun-Current. 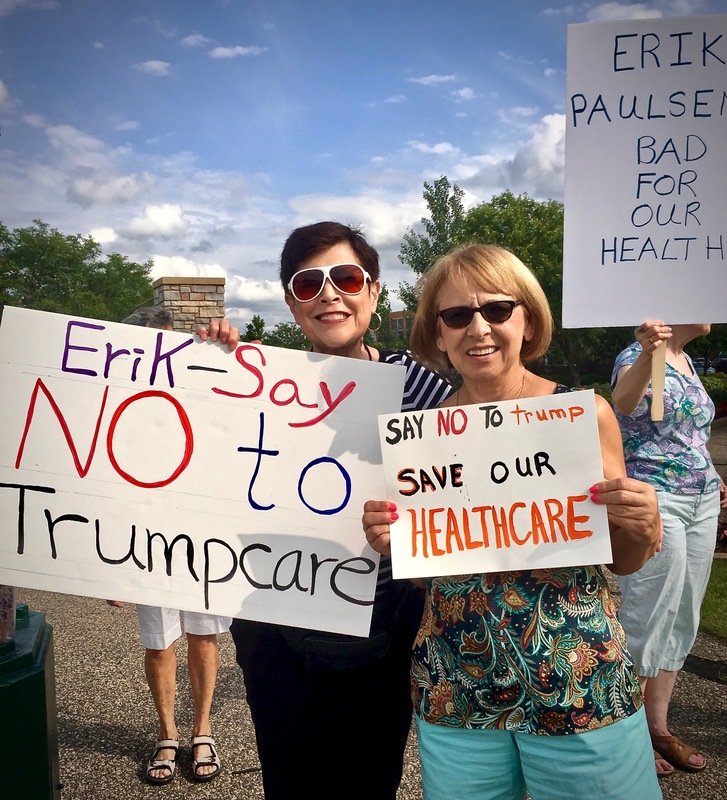 I wrote: “My congressman, Erik Paulsen, disappointed me on February 23rd.” I described all of the people who had driven from all around the district to speak to him, and that even though Paulsen was in the Twin Cities during a legislative recess, he seemingly couldn’t be bothered to show up at the town hall. My letter created a bit of a stir. I received several phone calls and emails from friends who had read it and were astonished at the audacity of Paulsen’s refusal to address his constituents. It was interesting to find out how many people were unaware of his neglect. I only got one negative comment, at the grocery store, from a former teaching colleague I ran into—he told me I should ”lay off Paulsen.” Sadly, the response I wanted the most—from Paulsen himself—never came. I also republished my letter-to-the-editor on Facebook where I received dozens of likes and positive comments. I’ll confess, they were all from my progressive friends, and not a peep from my Trump-supporting relatives and friends. What could they say? How do you defend a congressman who doesn’t ever show up for a town hall? After that, I visited Paulsen’s Eden Prairie, Minnesota office and went to other places and events where he was scheduled to appear. One memorable attempt, on a wet and dreary day, was at the U.S. Bank Building in Bloomington. Paulsen was slated to speak to the Rotary Club. I made a sign that said “We Love Obamacare,” took my umbrella, and arrived early to join other Paulsen seekers. We waited in the rain, chanting “Healthcare is a right” and “Hands off our health!” People who drove by honked and waved, but we never even got a glimpse of our congressman. Later, I found out Paulsen had entered the back door of the bank. It was sad to learn that he was such a coward. 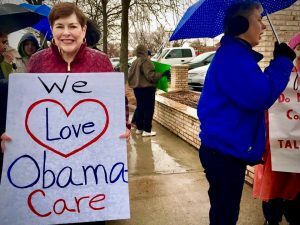 Jan Parks attends her first protest in the spring of 2017 outside a Bloomington, Minnesota bank where her Congressman, Erik Paulsen, had a speaking engagement. Paulsen or not, something good did come from that rainy day at the bank. I met Clara Severson, a young and powerful activist. She was only 23. Clara had the megaphone that day. She seemed fearless, and I had to talk to her. We became Facebook friends, and I soon realized that she was everywhere that Paulsen was — she was way ahead of me. 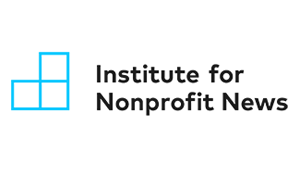 I learned that activists were organizing through large and growing “Indivisible” groups. They’d read the book Indivisible: a Practical Guide to Resisting the Trump Agenda by Ezra Levin. Clara started a large and active Indivisible group. Its main goal was simple—to oust Paulsen. Because of Clara, I found an Indivisible group that met close to my home, in the suburb of Edina. The members shared my interest in politics but, like me, they’d never really become politically active. They were mostly middle-aged or older. Michael was a retired superintendent of schools, Colleen was a retired teacher and grandmother of four, Jennifer had her own graphic design company and Joe was a CPA. We had 12 members total, each bringing a different perspective to the group. As time went by, some dropped out, and new ones joined. But no matter who was in attendance, we Edina Indivisible members also shared the same goal as Clara’s group—to replace Paulsen and elect someone who would resist the Trump agenda. By this time, I had come to believe that Paulsen was hoodwinking the entire district. Prior to his election to Congress, he’d served in the Minnesota House of Representatives for 14 years, portraying himself as a moderate since 1995. Yet again, this moniker of moderate was a big lie. In addition to having voted for nearly all of Trump’s initiatives, I learned that Paulsen almost never voted across the aisle (unless the vote was on the naming of a post office or some other non-controversial issue). One of his biggest donors was the National Rifle Association and he ranked sixth out of 435 House members when it came to accepting political action committee (PAC) money. Edina Indivisible decided to interview all of the Democratic candidates running against Paulsen in 2018. They consisted of Adam Jennings, a Minnesota National Guard veteran and a CFO of a company that makes products that remove ink and paint; Alicia Donahue, a businesswoman and co-founder of the 2017 St. Paul Women’s March; Brian Santa Maria, a family man and a former comedy writer for The Onion; and the aforementioned Dean Phillips, a businessman who owns coffee shops in Minneapolis, and whose family once owned a distilling company. 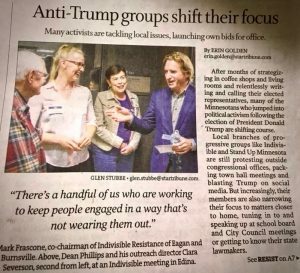 An October 30, 2017 article in the Minneapolis StarTribune featured a photo of Jan Parks and her new activist friend Clara Severson talking to congressional candidate Dean Phillips. We even invited Paulsen for an interview opportunity. Once again, and not surprisingly, he didn’t respond—even though I hand-delivered the invitation to his Washington, D.C. office during a family vacation there in the summer of 2017. 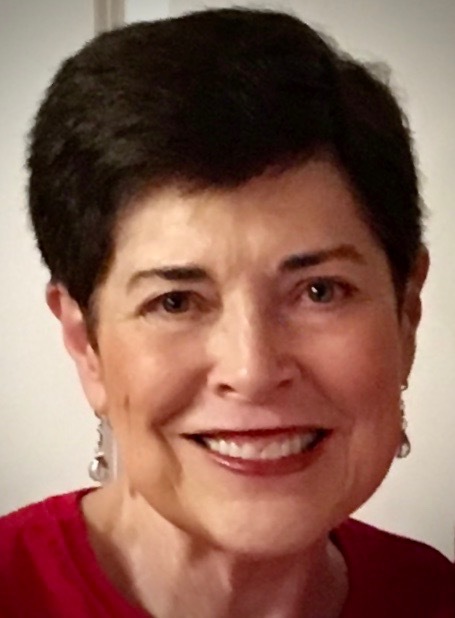 In January 2018, Edina Indivisible endorsed Phillips. Of all the candidates, we believed that Phillips best shared our progressive values, and had the personality and organization to win. I’d conversed with Phillips after several speaking events, and I saw him as a candidate who was growing in his ability to connect with voters. His warmth and charisma were definite assets, but his knowledge of the issues far surpassed that of the other candidates. Edina Indivisible needed a candidate who could defeat Paulsen and we enthusiastically believed Phillips was the right person for that job. In February 2018, my husband and I went to our caucus, held in a high school classroom, and met with about 25 other interested local Democrats from our precinct. Our charge for the night was to write resolutions to be submitted to the party platform committee and to choose delegates to attend what’s called the State Senate District Convention the next month, a convention where—among other races for political office—we would endorse a candidate for the U.S. House of Representatives. I was selected as a delegate. 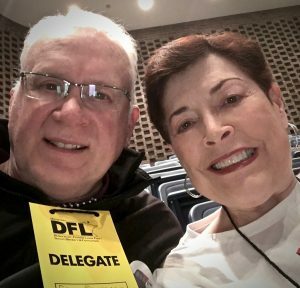 Jan Parks and husband Gary attend the Minnesota State Senate District Convention in March 2018. Later that month, on the day of the State Senate District Convention (this event was held at a middle school in Bloomington), I was ready to promote myself and shoot for the next delegate level—to become an official representative to the Third District Convention and also the Minnesota DFL Party Convention. (Minnesotans call the Democratic Party the Democratic Farmer Labor Party—or DFL.) Being a delegate entitles a person to vote for candidates at both their district convention and the Minnesota State Convention. It was obvious that the terrible time of Trump had motivated people to join in the political process in 2018. Everyone there seemed to know that we could not sit idly by—we had to become engaged. I wore a Dean Phillips t-shirt, and a big smile, as I maneuvered around the auditorium. I spoke passionately about my devotion to Phillips. The process is a bit complicated but, in the end, the goal was simply to get people to like me and believe that I was the best person to cast a vote for our candidates at the conventions. I was elected as an alternate. I was thrilled; I wanted to be a part of this action. Alternates are required to travel with the delegate to all future conventions in case the delegate cannot be there to vote. Altogether, 20 delegates and 20 alternates were elected that day. Jan Parks meets Minnesota Democratic Gubernatorial Candidate Tim Walz at the Minnesota State Senate District Convention in March 2018. At that point I started receiving calls—many calls—from the Phillips campaign. He already had my support, but I was being courted nonetheless, and I felt like a rock star. The ensuing fundraisers, Paulsen protests, meetings, and social activities kept me completely engaged. Next was the Third District Convention in another large suburb, Maple Grove. Delegates here would make their final choice as to who would become the DFL selection to oppose Paulsen. There were only two contenders at this point, because both Donahue and Santa Maria had dropped out. It was down to Phillips and Jennings. Weather forecasters predicted a dangerous blizzard for that Saturday in April. My husband advised me to stay home. “You’re just an alternate,” he said. But I went anyway. I had to be there. What if my delegate didn’t show? What if Phillips needed my vote? There was high drama at the convention. DFL officials froze the floor, meaning only official delegates were allowed to stay in the auditorium for the voting. (Yes, my delegate made it there.) The rest of us were required to leave; all of the alternates, spouses and children waited anxiously outside the auditorium. Most of the speeches had been given, but there were a few more made before the actual vote. Then, the announcement was made. Although Jennings had waged a good campaign, Phillips easily defeated him and was officially endorsed by the DFL. Next up: a Minnesota primary election before Phillips’ official nomination. The conclusion of the Third District Convention was a jubilant time, and I enjoyed every minute. I was feeling so celebratory that I almost forgot about the blizzard. Outside in the parking lot cars were stuck in the deepening snow. As I trudged to my Toyota 4-Runner, fellow Democrats pushed the cars of other Democrats. It was quite a sight. I knew I was. I am obsessed. I’d become a political junkie. When I got home, my husband said I was as white as the snow. I was exhausted. I crawled under the covers with a heating pad and thanked God I was alive, and that Dean Phillips had been endorsed by the DFL. I soon learned that this was only the beginning. One of the realities of politics is raising money, and lots of it, for campaigns. Phillips, to his credit, had sworn not to accept PAC money, lobbyist money or donations from other politicians. I decided I needed to help him with fundraising. We assembled our 35 guests in chairs in front of the fireplace, served them wine, cheese and fruit, and Rodvold told us why Phillips was the best man for the job. Hearing his gentle but convincing speech, and then talking with these voters, was so much fun for me. I was in my element. In the end, we collected checks of support, as well as some additional commitments for future monthly donations to Phillips’ campaign. The Minnesota DFL Party State Convention was held in Rochester in early June 2018. I was excited to go—believe it or not I had never stayed in a hotel by myself. I’d always traveled with my husband or a friend. I looked forward to the convention and being solo in some nice accommodations. I wore my Phillips t-shirt and buttons and volunteered to serve coffee to convention attendees. I asked people to sign a petition in support of “The Minnesota Way,” a pledge we presented to candidates asking them to decline campaign cash from PACs or lobbyists. Gubernatorial candidate Tim Walz came by for a chat, as did Minnesota Attorney General candidate Keith Ellison. Phillips stopped and gave me a hug for wearing his t-shirt. 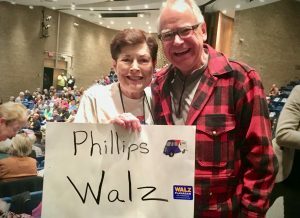 Since Phillips had already been endorsed by the DFL at the Third District Convention, the delegates were focused instead on whom to endorse for the big state offices. I listened to the many endorsement and candidate speeches and watched the first balloting, second balloting and on and on. It was all simply fascinating. My weekend there was exhausting and exhilarating. Although I didn’t get to vote, I was at the ready if my delegate had to step out. (She never did.) I learned so much that weekend, and once again I met a group of new people who were more than happy to participate and contribute to the processes of our great American democracy. In late July, I co-hosted another big Phillips fundraiser—this time at my house. We planned and prepared for months because Phillips had promised to attend. I knew my home wasn’t large enough to accommodate a crowd of hundreds, so we decided on a yard party. I always fret about my flowers and grass, so we made sure they were groomed to perfection. Everything was set—and then, of course, it wasn’t. Moles invaded our yard just days before the event! My husband did his best to stamp down the tunnels and put poison in the mole holes, but the grass was still lumpy in spots. I became too busy to worry. We sent out e-mail invites to everyone we knew, but had no idea how many people would actually come. My husband kept saying, “Have you thought of what we’ll do if it rains?” So we cleaned the entire house and got the basement ready, just in case it poured. By this time, my family, friends and neighbors started getting involved. I like to think that my unbridled enthusiasm spread to all of my loved ones. A good friend donated six bottles of amazing wine. My co-hostess Colleen brought delicious appetizers. My daughter and son-in-law came early to help my husband set up the tables and umbrellas outside. They also poured wine and showed people to the hors’ d’oeuvres table inside. Two of my friends collected donations and pledge cards at a decorated table under my oak tree in the front yard. 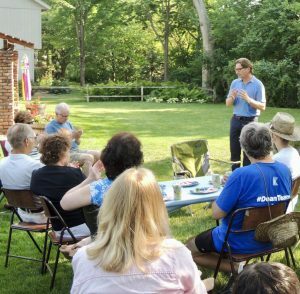 Minnesota Third District Congressional Candidate Dean Phillips speaks at a fundraiser in Jan Parks’ back yard in July 2018. He told the guests that no matter what they considered to be their number one issue, he hoped they would join him and make campaign finance reform their number two issue. He told them he would absolutely NOT accept PAC or lobbyist donations. He denounced the contributions that Paulsen had accepted from the NRA, and he pledged that he would never follow suit. He would not be beholden to anyone, he promised, but his voters. Phillips went on to promise that he’d do his best to pass legislation to curb gun violence and said he would always be available and accessible to voters. He pledged to schedule monthly town halls in the Third District and that he would actually BE THERE. The crowd roared again. Phillips knocked it out of the park, or yard—my yard! I found out later that we raised more than $5,000 for him at this fundraiser. I just knew then that Phillips was on his way to Congress. Next up: the August 2018 primary. Although Phillips’ campaign was gaining momentum by the minute, no one was taking a primary win for granted. There was suddenly yet another challenger on the ballot—a man named Cole Young. Although the other official contenders had dropped out or been defeated, this new candidate emerged because in Minnesota any registered DFL-er can put his or her name on the ballot at almost any time by submitting paperwork and a $300 fee. Young didn’t wage a robust campaign like Phillips, but he did have a targeted moniker; he was calling himself the “Millennial Congressional Candidate.” I had to make sure that Young was soundly defeated. I decided I needed to up my game yet another notch. I started knocking on doors for both Phillips and DFL candidates in other races. There was too much at stake to stop now. I found that I was good at door knocking—and boldly asking people if I could plant campaign signs in their yards. Since we only rang the bells of registered Democrats, for the most part people were friendly and willing. Only one bad experience: one man opened his door and, for some unknown reason, told us we were “Nazis.” The name caller didn’t frighten us though. It was about 95 degrees that day—maybe we were so exhausted at that point that we didn’t care. I just said, ”I’m sorry you feel that way.” We had learned from door knocking training not to argue and to just move on. We did. Phillips ended up easily beating Young in the primary, but my door knocking wasn’t wasted time. People needed to know about Phillips. Every knock, every chat, and every planted sign were important. The days and weeks leading up to the November midterm election were packed with activities. My Indivisible group was out registering voters, marching in parades, hosting precinct parties, planting more lawn signs, and writing postcards. I was with them, every step of the way. I also appeared in a Facebook video ad for Phillips. Although I’m no shrinking violet, I did not want to do this. I’m too self-conscious! Nonetheless, one of my new friends from the campaign trail, Mia Olson, convinced me that I’d be great at advocating for Phillips on-camera because, as a teacher, I’d been speaking in front of audiences (students) for years. Mia is the kind of committed activist you see on freeway bridges with signs, often in freezing rush-hour weather, promoting progressive causes. Needless to say, she was quite persuasive. Johnathon McClellan, a Phillips’ volunteer, paid for the entire Facebook video ad out of his own pocket. He held the camera, another man held the lights, and they filmed 10 voters (including me) explaining in 15 seconds or less why they supported Phillips. I was up first and my topic was education. McClellan and I tried a number of different approaches to the message, and in the end I simply said, “Dean Phillips supports early childhood education, our schools, and he’s the best voice for the future of our children.” This simple message was, believe it or not, painful to master because we kept revising it, I kept saying “um,” or I would laugh at myself or stumble on my words. (I didn’t have any cue cards, much less a TelePrompter.) Eventually I nailed it, and I’m ready for my next close-up! Phillips told McClellan he loved it, and the finished video received about 10,000 views on a variety of platforms. Mia then presented me with a new challenge. She was an outreach coordinator for yet another candidate—Dave Hutchison. “Hutch” was running for sheriff of Hennepin County (my county) and Mia asked me to add him to my campaigning efforts. He’d been a Minneapolis transit cop for 15 years, he lives in Bloomington (my city), he’s married, and he’s gay. I knew that getting Hutch to victory was going to be a tall order. He had to run against an incumbent juggernaut, Rich Stanek, who’d been Hennepin County Sheriff for 12 years. I saw Stanek signs all over town and his constituency seemed huge. The Hennepin County Sheriff’s race is a non-partisan race, but Hutch is a Democrat and Stanek is a Republican. Mia reminded me that Stanek had sent his deputies to Standing Rock Indian Reservation in North Dakotain December 2016. At the time, protesters were standing with the Native Americans there, fighting against the North Dakota Access Pipeline. The people of the reservation were simply protecting their water; Stanek ordered his deputies to discourage the protesters. This situation received widespread local news coverage in 2016, and I remember thinking it was wrong that Minnesota resources were being used in connection with a political protest in another state. More than wrong, actually—it was racist and obscene. Mia, of course, had traveled with her family to protest the pipeline. After the deputy interference, she was determined to defeat Stanek and believed Hutch was the candidate who could do it. I was reluctant at first because I was so busy with my work for Philips. But then I met Hutch. He’s a big man, a strong and fair-minded man, and most importantly, a man who believes that all people deserve respect. He wants to protect Native Americans, as well as immigrants, from discriminatory treatment. Unlike Stanek, Hutch supports keeping ICE (Immigration and Customs Enforcement) separate from Hennepin County. He believes that immigrants should be able to report crimes to the county without fear of being deported by ICE. These policy stances endeared me to him immediately, and I committed myself to campaigning for him as well; Hutch was a superbly qualified candidate and I knew he needed me. 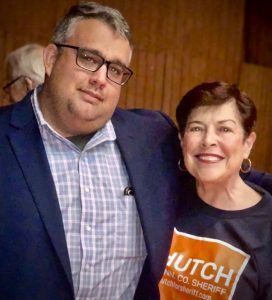 Jan Parks attends a health care symposium with Hennepin County (Minnesota) Sheriff candidate Dave “Hutch” Hutchinson in September 2018. Mia told me that Hutch was popular in the parts of Hennepin County where he was already well known, primarily in Minneapolis. He just needed more votes in the suburbs, especially in Edina and Bloomington. I started calling up my Democratic friends and asking if I could plant a Hutch sign in their yards. Most of them didn’t know that Hutch was a Democrat or anything about his stances on issues. I found that, within five minutes or so, I could usually convince them to not only accept a yard sign but to vote for Hutch as well! Still, I soon realized that in order to rustle up enough votes to get him elected, I had to become even more aggressive. I started knocking on doors where I saw signs in support of Democrats like Phillips or Tim Walz (now confirmed as the DFL candidate for Minnesota governor) and asked these residents if they’d accept a Hutch sign, too. I gave them campaign literature and talked about Stanek and his troubling record. People who were home and talked to me mostly said yes. Democrats were feeling the fire, and they wanted to support Democratic candidates. It was exhilarating, and it was my own grass roots effort, launched in those very important last few months before Election Day on November 6. 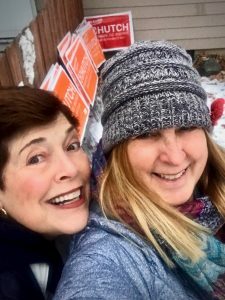 Jan Parks and her new activist friend Mia Olson in November 2018 with some of the yard signs for Hennepin County (Minnesota) Sheriff candidate Dave “Hutch” Hutchinson that they planted in the yards of voters. Election night was magical. Prior to the victory celebration, I attended a “pre-game” party with the Edina Indivisible folks. 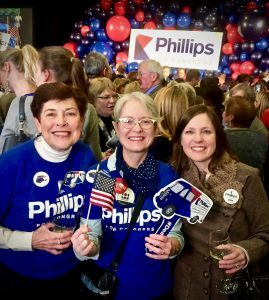 Most of us wore our Phillips t-shirts with white turtlenecks underneath and we were united in both excitement and anxiety, awaiting the night’s results. This evening was the culmination of our 18-month mission. Fortunately, a little wine helped to calm our nerves while we watched some early national results. “Would the Blue Wave be a reality?” we wondered. We then caravanned to the Bloomington Hilton Hotel for the Phillips victory party. The ballroom was packed. There were hundreds of red, white and blue balloons. (Other major state candidates, including Hutch, had their own victory parties.) Television news photographers and reporters were there to capture the event and I stood by the cameras soaking in the history and excitement of the evening. The polls had indicated that Phillips was ahead, but what if they were wrong? There had been such an enormous amount of money spent on negative TV ads against him. There was no polling data on the county sheriff’s race, and the Hutch campaign hadn’t spent much money on ads. I was hopeful that both of my candidates would win but, at that point, I was more nervous than optimistic. Finally, at about 9:30 p.m., the ballroom announcer excitedly told us that the Third District race had been called and Phillips had won! It was an ecstatic moment for his supporters, the music was cranked up, and a flash mob of dancers clad in blue Phillips t-shirts leaped onto the stage to perform that classic 1972 hit “Love Train” by The O’Jays. It was magic! Jan Parks on election night, November 2018, at the Bloomington, Minnesota Hilton Hotel with friends Jennifer O’Brien and Liz Matassa. Soon after, a very happy Dean Phillips—Congressman Dean Phillips—came onto the stage. He introduced his mother, his brother, his two daughters and his girlfriend (now his fiancé). He thanked everyone repeatedly, and pledged to always listen to us. I kept trying to get the attention of Phillips’ campaign aides who were engrossed in their phones, looking for news of other races. Finally, I learned that Hutch also appeared to be the winner in his race. It hadn’t been officially called though, so I couldn’t yet let myself celebrate two victories just yet. “Nothing is official,” I told myself, but my hopes were on the rise. There was even more happy news that night as the highly anticipated “blue wave” crashed hard on Minnesota’s shores. All of the top Minnesota offices were won by DFL candidates, including Walz for governor and Amy Klobuchar and Tina Smith in the U.S. Senate. There were many happy tears and hugs that night. I’ll never forget when Phillips came through the crowd to greet his supporters and we had him in our clutches for a few short minutes. The congressman was obviously thrilled. Phillips is a grateful person, and he thanked me personally for helping get the win. The next day, the official results of the sheriff’s race were announced. Hutch won by a whisker, by less than half a percentage point—just 2,340 votes! In the sheriff’s race, every vote counted and I’d like to believe that my efforts helped push him over the top. I had to wait to congratulate him personally until several weeks later at yet another victory party. During these two past two years I’ve learned that it takes an enormous amount of hard work by many people to change the political landscape in our country. I learned that house parties and phone calls and door knocking work. There’s a potential new voter at every event, answering every ring, and opening every door. I learned my lifetime of journalism experience could be put to tremendous use—I not only penned three more letters-to-the-editor, I also helped other writers get published in their suburban newspapers. I used to say, “Retirement isn’t what it’s cracked up to be” because, frankly, I was bored. When I was teaching, I met new and memorable people every year—most were teenagers, who I enjoyed, but many others were interesting adults. In retirement, my world became smaller. Yet through activism my world has expanded once again. I have met, and continue to meet, energized and influential people of all ages. My social life has perked up because there are always fundraisers and celebrations to attend, and I enjoy them immensely. I know I couldn’t have become an activist when I was teaching. Activism requires time and energy—and both were in short supply after a full day with students. I do know people who work full time and are also magnificent activists, but they envy my ability to attend events at any hour of the day. 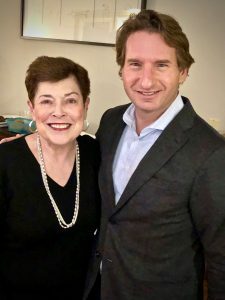 Jan Parks attends a fundraiser for a Bloomington, Minnesota city council candidate with newly-minted Minnesota Congressman Dean Phillips in February 2019. While I firmly believe that the terrible time of Trump has had a disastrous effect on our democracy, his presidency has also awakened a new sense of civic duty in people, and created a much-needed recommitment to decency. I’ve met teenagers who are starting Indivisible groups and Millennials who plan to run for office. It’s an exciting time to get involved. I feel fortunate that my husband, daughter, and son-in-law have been amazingly supportive. They’ve gone door knocking with me, and cheered me on. We’ve always loved “talking politics” and those conversations have only increased during the past two years. At the same time, I know I’ve neglected some of my old friends. Though I’ve invited them to join me on the campaign trail, most haven’t caught the fever. They’re busy being grandparents or heading south for half the year to escape our brutal Minnesota winters. I’ve been making an effort to catch up with their activities, but it’s hard, because I’ve made so many new friends who vie for my time and attention. Speaking of, my new friend Clara is already working hard on the “Phillips for Congress 2020” staff and my new friend Mia is a 2019 candidate for the Bloomington School Board. I plan to be there for these, and other, progressive women I met during Election 2018. I’m not done with politics yet—nope, just getting started! I was recently at a victory party and someone asked me, “What are you going to do now, Jan?” My response was instantaneous. “I’m going to focus on violence prevention legislation,” I said. I meant it, too. Through a group called Moms Demand Action, a grassroots movement of Americans fighting for public safety measures that can protect people from violence, I’m doing just that. You see, when you’re a political activist, your work is never really done. Yep, recipes, relaxation—and especially rocking chairs—will have to wait a little longer.